The Trinity-Sergius Lavra - one of the most famous male stavropegic monasteries, location – Moscow region, Sergiev Posad. It is believed that it was founded in 1937 when Sergius of Radonezh settled at Makovets, there are his relics today. Sergius Lavra is located in the famous Moscow region town of Sergiev Posad, which is part of the "Golden ring" of Russia. Since 1862 the settlement and the capital, as well as one of the most beautiful old towns of Yaroslavl links rail links. Every year during the high tourist season open additional rail routes in 2012-2013 was opened direct message "Posad – Balakirev" (North direction) and "Posad – Yaroslavl Passenger station" (South direction). Runs the train, having noticed the locals feature: unlike intercity transport, where rush hour falls on the morning and evening (the movement of the population from work to work), the trains rush hours from 11-00 to 15-00. From the train station to the laurels is a significant number of buses. Travel companies offer group Shuttle service, buses of this type can be identified by a large sticker on the windshield and always present guide with a megaphone. To deliver the guests to the monastery be happy and taxi drivers, they have special Parking near the entrance to the station. However, the price of services can be confusing. By bus to Sergiev Posad can be reached by route No. 388, this is the Express from the metro station "VDNKH". The buses run every 10-15 minutes. Roads without traffic - about an hour. Upon arrival, you will need to walk. You need to go out of St. Sergius, which will lead to Pancake mountain, it offers beautiful views of the Lavra. Next is to go through quite a bit to get down the mountain, go through the underpass and you find yourself right next to Sergius Lavra. On the machine. Worth to go as early as possible, otherwise you will not be able to Park near the monastery. From the center of Moscow you need to go to Prospect Mira, after 45 kilometres you will see a turn to Sergiev Posad. Then you will need to drive a little more than 10 kilometers to the city. Main street - the Avenue of the red Army, lead to the Lavra. Leave the car just on the street Bethany or Kalichya Tower. On the train. From the Yaroslavl station you need to get to the station "Komsomolskaya" to the station Sergiev Posad. Trains run daily and frequently. If by train, the station Aleksandrov or Balakirevo. These trains also stop in Sergiev Posad. To the later Liturgy for the right train with a departure time of 7:28, and to the all-night vigil in 14:31 or 14:37. In about half an hour. 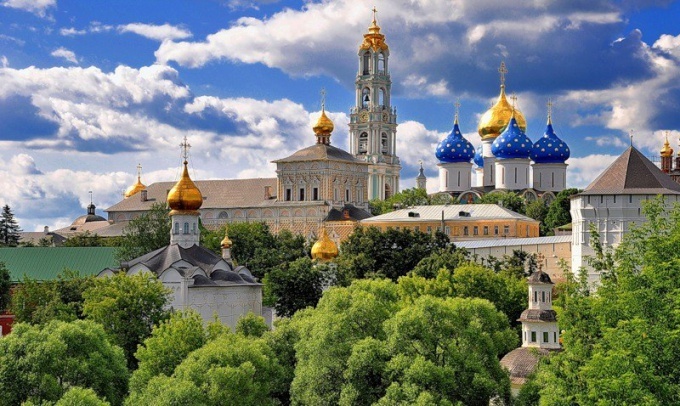 The status of Lavra monastery the monastery was granted in 1742 by Empress Elizabeth, but in 1920 the Council of people's Commissars ordered the closure of the monastery, which lay forgotten for more than 25 years. Reconstruction began only in 1946. In the monastery iconostasis, which was created by Andrei Rublev and Daniel Black. Today, the monastery is the object which is under protection of UNESCO, now Holy Trinity-St. Sergius Lavra – one of the largest monasteries and a place of pilgrimage for people from all over Russia. 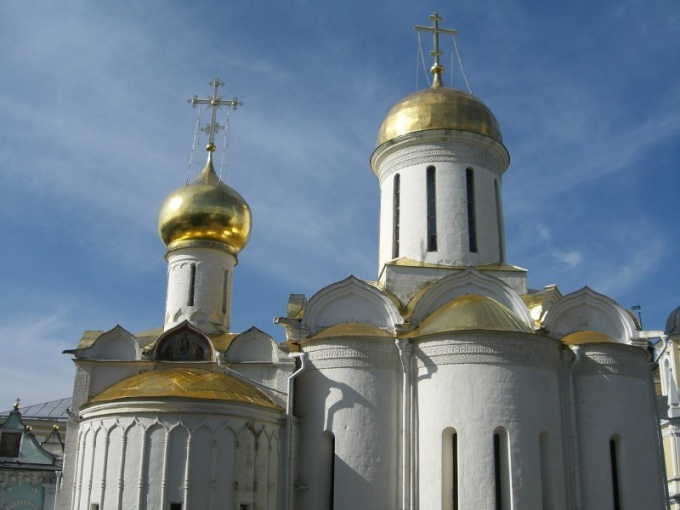 Sergiev Posad is the largest center of Russian Orthodoxy in the European part of Russia. Every year the city is visited by thousands of tourists and pilgrims, fortunately, it is easy to reach from Moscow by public transport. Daily from the platform of the Yaroslavl station in the direction of Sergiev Posad goes more than 50 trains, including those that go to Alexandrov and of Balakirev. The first leaves at 5 am and the last at almost midnight. Journey time is about an hour and a half. This way to get to Sergiev Posad has two advantages. First, the journey starts from the center of Moscow, and, secondly, delays unlikely that trains run on schedule. To specify the time of departure of trains on the official website of Russian Railways. This form of public transport is a fast train. Sergievsky Express makes only one intermediate stop in Pushkino and goes for one hour. Twice a day are high-speed trains with five intermediate stops, but the journey to them takes only a few minutes more. The fare is about one and a half times higher in comparison with conventional train. You can go from the metro ENEA. On the Avenue leading to the exhibition center, you would find the stop of bus number 338 to Sergiyev Posad. Departing every 10 minutes. The journey time will be half an hour, during peak hours, possible delays due to traffic jams on the road from Moscow in Mytishchi and Pushkino district. In the city bus does stop at the Factory, Vorob and Cooperative the streets. From the Shchelkovo bus station buses to Kostroma, Uglich and Rybinsk. They make an intermediate stop in Sergiev Posad on the bus. To get to Sergiev Posad by car, you must leave Moscow on the Yaroslavl highway and move about 40 km after the intersection with the ring road, anywhere without turning. After the turn of Radonezh and the exaltation of the cross, must be careful, however, interchange the Yaroslavl highway, with a branch in Sergiev Posad to see fail. After it you need to go about 15 km, near the town the road becomes the Moscow highway and enters the Avenue of the red Army.